The Insurance Institute for Highway Safety (IIHS) wants to restrict the use of LSVs on public roads over concerns about crash safety, or have the government review current LSV safety standards. Based on results from recent crash tests, the IIHS believes the mixing of LSVs with larger , full-functioning vehicles is a recipe for more serious injuries and deaths in vehicle accidents. Another article on the issue provided some responses from LSV manufacturers. An article covering technology developments from Asian household appliance manufacturers noted recent advances in washing machine motors and their applicability for electric vehicles. A performance requirement for washing machine motors is that they operate at low rpm and high torque for the wash cycle but high rpm and lower torque for the spin cycle. According to washing machine manufacturers, washing requires about six times the torque of spin-dry, but spin-dry has to rotate about 30 times faster than washing. Manufacturers such as Toshiba, Panasonic and Hitachi are implementing variable magnet, switchable winding and dual rotor technologies to change washing machine motor characteristics between low-speed and high-speed operation. Depending on the technology used, improvements have been realized in one or more of the following areas: washing or spin-dry performance, energy consumption and quiet operation. For example, Toshiba used variable magnets to improve washing torque by 20%, and boost spin-dry speed 1.4 times to 1700rpm as well as reduce motor power consumption by up to 16%. Toshiba expects the same technology to appear in EVs, electric motorcycles and other applications as well. Meanwhile Yaskawa Electric Corp. of Japan, a major manufacturer of industrial robots, expects to apply winding switch technology to EVs and exhibited a new type of motor at the 1st EV & HEV Drive System Technology Expo held in January 2010. The Alternative fuel Vehicle Institute presented GEM with their 2010 EV-angelism Award at the group’s national conference and expo. AFVI honored GEM for its history and leadership in the low-speed, Neighborhood Electric Vehicle (NEV) market, noting the company’s commitment to manufacturing environmentally-friendly vehicles and its long service, which has helped build credibility for the NEV industry as a whole. 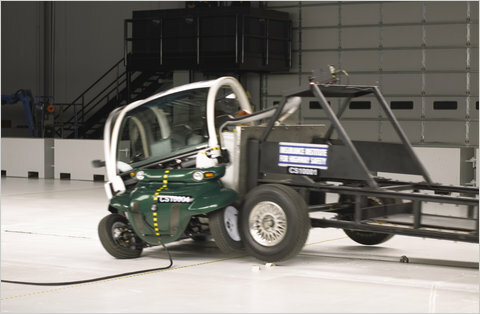 Club Car editorial – The CEO of Club Car, Gary S. Michel recently wrote an opinion piece in the Augusta Chronicle promoting the local manufacturers of golf cars, LSVs and light transportation vehicles (LTVs) as a “clean and green” industry that can not only help the environment but the economy as well. He asks for state legislators to help expand the market for these type of vehicles through a variety of government actions. Specifically, our industry would like to see lawmakers enact legislation that breaks down barriers to the expanded use of electric vehicles. Passage of Senate Bill 519 last month, which would allow LTVs to operate after sunset as long as they met other requirements, was a step in the right direction. But we also need the legislature to create tax incentives that encourage consumers and businesses to purchase electric vehicles, as well as incentives for manufacturers to create “green” jobs. What’s more, we need increased discussion and coordination between government, education and other business stakeholders to promote innovative ways to expand the use of light transportation vehicles. Club Car partners with Gary Player – Earlier this month Club Car announced a multiyear marketing agreement with Gary Player and Black Knight International to promote each others brands internationally. Under terms of the agreement, Black Knight International, which includes Gary Player Design, Player Real Estate, Black Knight Enterprises and The Player Foundation, will work with Club Car to introduce the company’s vehicles, equipment and services at courses and real estate developments where Black Knight is affiliated. Club Car also will develop strategies to promote the company and its golf car and utility vehicle lines through an association with the Gary Player brand. CT&T is working with the governor of Hawaii to build an electric vehicle assembly plant. According to reports, Oahu is the general location mentioned in the memorandum of understanding signed with the governor. CT&T reports looking at four potential sites in the area for a facility that will produce up to 10,000 low speed vehicles annually. The company hopes to have the plant operating in two years. Comment: Hawaii now joins Pennsylvania and North Carolina as potential locations for assembly plants. To date none of these plans have come to fruition beyond the early planning stages. The company was talking about Pennsylvania locations back in September 2009. A plant with the capacity to produce 10,000 vehicles seems very high for the Hawaiian market and shipping them from Hawaii, at first glance, would appear to be an expensive way to supply other markets. It remains to be seen if plans for any of these potential plant locations moves to the next stage.